Douglas Kellner offers a systematic, critically informed political and institutional study of television in the United States. Focusing on the relationship among television, the state, and business, he traces the history of television broadcasting, emphasizing its socioeconomic impact and its growing political power. Acknowledging that television has long served the interests of the powerful, he points out that it has dramatized conflicts within society and has on occasion led to valuable social criticism.Kellner's examination of television in the 1980s and, in particular, its role in the 1988 presidential election yields the conclusion that in our time television has worked increasingly to further conservative hegemony. 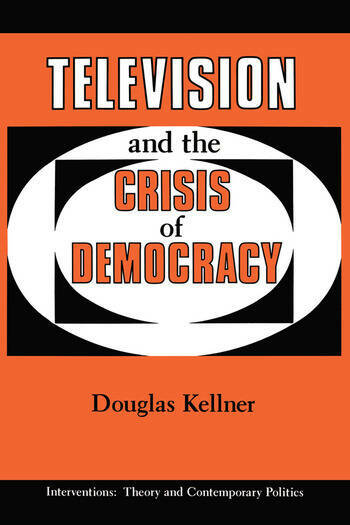 In so doing, Kellner argues, contemporary television has helped produce a crisis of democracy.But Television and the Crisis of Democracy goes beyond description and diagnosis. In a discussion that is both analytical and comparative, Kellner presents alternative models to the existing structure of commercial broadcasting and shows how new technologies might be used to create a more democratic future for television?one that could enhance political knowledge and participation.